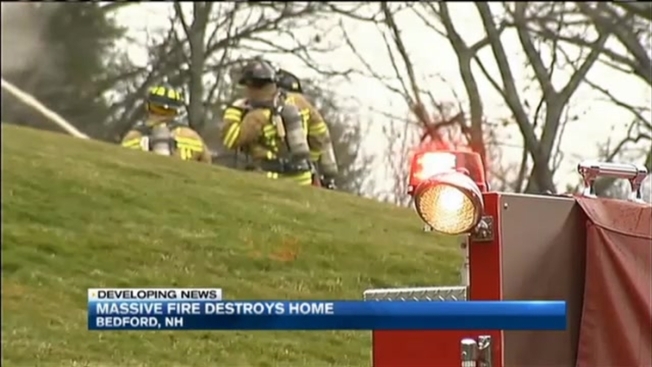 A family of five is safe and no firefighters were injured as crews battled a massive fire that consumed a brick home in New Hampshire Tuesday afternoon. Authorities in Bedford say the fire at 4 Burleigh Terrace started around 12:30 p.m. while the residents were still inside. More than 50 firefighters responded to the scene. Smoke could be seen for miles, and the flames could been seen from nearby neighborhoods. Necn spoke with one family member who lives there. He says his parents and two siblings are shaken, but will be okay. Bedford Fire Chief Scott Wiggins says because the home is in a rural area, the nearest fire hydrant was about a mile away, causing first responders to raise the call to five alarms for tanker trucks. Flames were raging through the attic and the walls and burst out once firefighters cut into the roof, but Chief Wiggins say while it took some time to get things under control, the weather was certainly working in their favor. "Weather conditions are very favorable. Two days ago, when the winds were rolling, ash embers would take the woodlands here. A misty day keeps everything on site," he said. The Red Cross of New Hampshire said it has responded to the scene of the house fire and is supporting first responders with food and drinks. It will also provide the family with shelter. The family says they had one pet, a hamster, and the little guy got out safely, too. 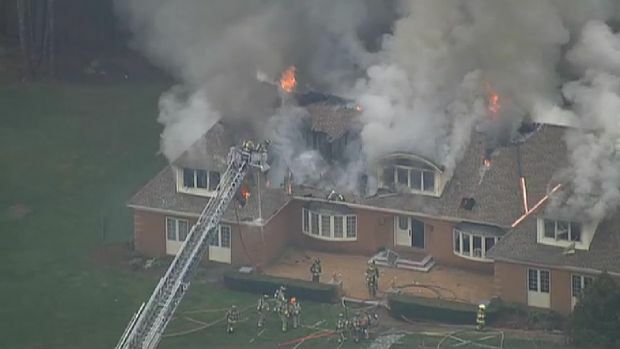 Crews in Bedford, New Hampshire, are battling a massive, smoky fire that has consumed the top floor of a house.